New member Omi from Abs cbn with his friend,Freely Abrigo from Manila Bulletin, Ben Nacion from Bandilla, Sir Boboy Yonzon of Mango Comics, Andrew Villar from Manila Bulletin, Ed Padilla from Kabayan, Philipe Cruz from Manila Bulletin, Totoy Yonzon from Mango Comics, Jun Aquino from Philippine Free Press, Blad Usi from Remante, Manila Times, etc., William Contreras from Manila Bulletin, Syeri Baet from Manila Bulletin and Komikon, Ariel Atienza, Norman Isaac from Manila Bulletin. 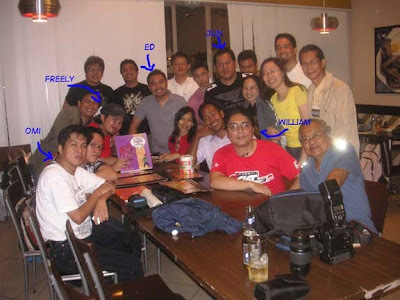 Not in Photo: Sir Barry Jose, Rene Aranda from Philippine Star, Romy Buen from Abante, Stanley Chi and Julius Villanueva from Manila Bulletin, and others whom I can't remeber their names as of now. 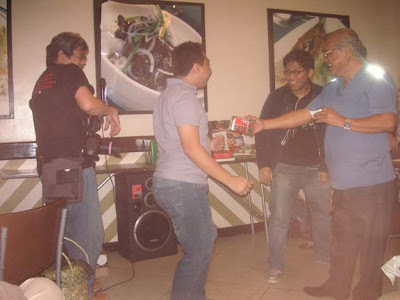 Ed Padilla and Sir Boboy dancing. Yeah we have to dance in order to receive our exchange gifts. 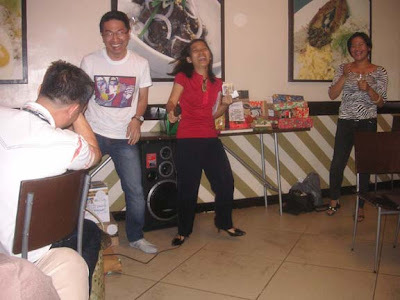 Ang makulit na DJ and leader sa group namin na palpak, Romy from Abante and Remante tabloid. Pero ok lang, maganda naman taste niya sa musiko.. napaglumaan na. I ended up winning a rice cooker. Then got a Philippine Cartoon History from exchange gift galing kay Jun Aquino. 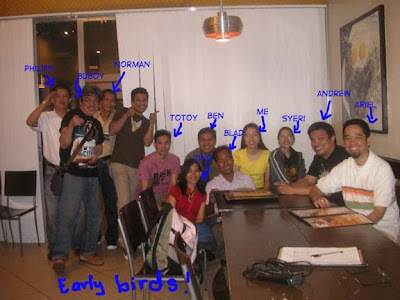 Me, Stan, Julius, Andrew, Ariel, Sir Boboy together with Jing, Charm and two other guys (sorry! forgot your names) ended up in a coffee shop after the party. It was an enjoyable experience even the travel is so damn far. wow, mga kakilala ko pala. si ben nacion ay first cousin ni misis, si philip cruz ay cartoonist din namin sa the batangas post at offcemate ko dati sa atlas, si usi ay cartoonist ng the buzz magasin, naging officemate ko naman sa manila times. ang taga-abas-cbn ay si omeng (rommel estanislao) at hindi si omi (romi lizada). hehe.. si omeng pala yun... alam ko he looks familiar pero di ko lang talaga maalala... yun pala, friend mo!